The San Francisco Giants offer youth baseball camps in Northern California for boys and girls ages 4-13. Featuring the highest caliber staff, Giants Baseball Camps are the perfect combination of baseball instruction, competition, and fun! For more information, please contact our Customer Experience team via telephone (415-800-2014) or email (info@sfgiantscamps.com). Giants Baseball Camps are offered for boys and girls ages 4-13 of all skill levels. Each camp session is weeklong (Monday-Friday) from 9:00 AM - 3:00 PM. 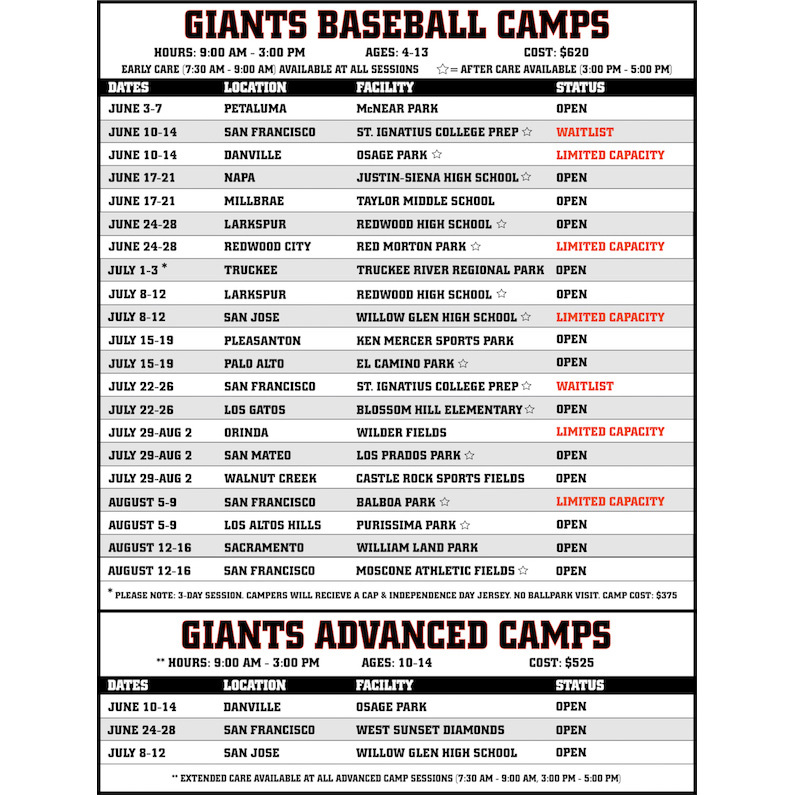 Giants Baseball Camps features five action-packed days of individualized instruction, marquee competitions, and special events. Each day of Giants Camp features a personal character theme, teaching campers lessons on the diamond that they can utilize off the field to become more outstanding young men and women. Each morning, Giants Camps coaches provide campers with individualized tips and tools for improvement during our "Train and Compete" stations. The structure of these stations allows campers to immediately apply the skills they have learned to an exciting competition where prizes are on the line. Campers' opportunities to improve their skillsets continue each afternoon during the weeklong World Series Tournament. During these tournament games, coaches utilize teachable moments to help each camper develop their game even further. What are people saying about Giants Baseball Camp? "SF Giants Camp was my son's favorite camp of the summer. From learning more about the game to visiting Oracle Park to playing with his friends, he had an absolute blast… We will definitely be back." "Camp staff were wonderful, everything was well organized, communication was excellent, and most of all, my 5-year-old son was happy, tired, and filthy at the end of each day. My son wants to wear his Giants cap everyday to proudly show off his stickers and pins, which makes my heart melt. Go Giants!" "[We've] been attending Giants Camp since the program started four camp seasons ago. He loves baseball, and it's a great way for him to connect with his favorite team. The coaches have always been so positive, supportive and communicative...all around fantastic. [My son] and his friends say it's educational, great skill building, and really fun!! We've really loved being a part of the Giants Baseball Camps family!!" "Giants Baseball Camps are simply the best-run, most well organized sports camp I've ever experienced and we have been to many, many camps. Thanks for making this the highlight of their summer!" "My son had the best time! This is his 3rd year, and each year he has said it's gotten better and better :) thank you!!!" "Our son loved his week of camp; he came home each day full of excitement, great stories and smiles. His confidence grew and he raved about all of his coaches. Thanks for a great week!" Over the past four years, Giants Baseball Camp has welcomed over 150 children to our programs, at no charge, via Bay Area nonprofits that work to provide valuable experiences for deserving children. While Giants Baseball Camp is a fee-based summer camp program, Junior Giants is a free, non-competitive, and coed baseball program for youth ages 5-18. Working together with local agencies, families, and volunteers, Junior Giants reaches into communities and offers youth a chance to learn the basics of baseball during the summer while also discovering the importance of essential life skills. In 2015, the Junior Giants program was chosen as the recipient of the Commissioner's Award for Philanthropic Excellence. The award was created in 2010 to recognize the charitable and philanthropic efforts of MLB Clubs. Q: How much does Giants Baseball Camp cost? Q: Does Giants Baseball Camps offer Extended Care? A: Early Care is available from 7:30 AM - 9:00 AM at all sessions. After Care is only available at some sessions from 3:00 PM - 5:00 PM. Please refer to our camp schedule for After Care availability. Q: How much does Extended Care cost? A: Campers should wear their Giants Camps uniform and bring a baseball glove, clearly marked lunch and snack, sunscreen, and water bottle. Additional baseball gear is optional (bat, helmet, cleats). Q: Does Giants Baseball Camps provide lunch? Q: Does Giants Baseball Camps have a trainer on staff? A: Yes, a medically certified trainer is onsite each camp day. Q: How does Giants Baseball Camps accommodate children with allergies? A: Safety is the cornerstone of our camp program. We have detailed safety procedures regarding allergies, and each of our staff members is trained on how to identify an allergic reaction and how to make use of an EpiPen. Each camper's coach is made aware of all allergies on his/her team. Also, each camper with allergies is given a wristband to identify them during lunch hours and throughout camp. Q: Is payment in full required to reserve a spot in a particular session? A: Yes, in order to reserve a spot in a particular session, full tuition payment is required. Q: What kind of shoes should my child wear to camp? A: Cleats (must be non-metal) or athletic shoes are recommended, except on ballpark visit day. Campers are not allowed to wear cleats to Oracle Park. Q: Can I chaperone the trip to Oracle Park? A: Unfortunately, we are unable to accommodate parents/guardians on our visits to Oracle Park. However, we do maintain a 4:1 camper to staff ratio (including ballpark security and team personnel) to ensure maximum supervision and camper safety. During each visit, Oracle Park will be closed to the general public and no Giants game will be taking place. A: Please call (415) 800-2014 or email info@sfgiantscamps.com. Our Customer Experience team will be happy to answer any of your questions! Have any questions? Please call (415) 800-2014 or email info@sfgiantscamps.com. Our Customer Experience team is eager to help make this an amazing experience for your family! The San Francisco Giants are excited to introduce a new line of instructional baseball camps geared towards young ballplayers looking to take their game to the next level. Giants Advanced Camp features five days of focused instruction and games delivered by established coaches who have coached at the high school, collegiate, and professional levels. Giants Advanced Camps feature an exclusive visit from a current San Francisco Giants coach or former Giants player.